A Geelong Party Shop with guaranteed CHEAPEST prices! We sell Geelong’s CHEAPEST balloons! How much are you paying for your inflated balloons Geelong? 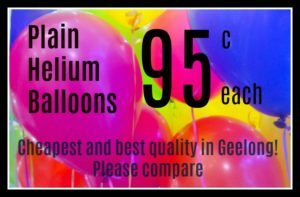 Geelong Party Supplies has the cheapest balloon prices for plain inflated balloons just 95 cents per balloon. Don’t ruin your party’s budget by paying up to $1.50 at other party stores! You can also add hi-float, which will make your balloon last that little bit longer for just 35 cents per balloon. Need a balloon bouquet for your table centre? We can do that too! Just ask our friendly staff. Look no further than Geelong Party Supplies for the region’s largest range of party supplies at the cheapest prices! We are Geelong’s party specialists and have gathered together a quality range of party and catering supplies that will make any event the talk of the town – whatever the occasion. Birthday party supplies for ages ranging from 1 to 100! Learn more about our friendly team in About Us and we can help you plan an event that people will be talking about for years to come in our FAQs. Better still – why not visit our Geelong party shop at Shop 1B, 110-112 High Street, Belmont. We’re located opposite Tasman Meats, just turn into our car park at Subway and you’ll easily find us. Take a Tour of our shop just CLICK on PHOTO BELOW and follow the arrows.